No I'm not dead. My work ended up taking almost all of my time last year and good amount of this year as well. But, now I have a new schedule and I finally got my work desk in some sort of order.To celebrate I decided to paint a few new things. Now if I could only get some time to actually play a game. Right now I'm still working all hours on weekends. Anyway here's the first item. 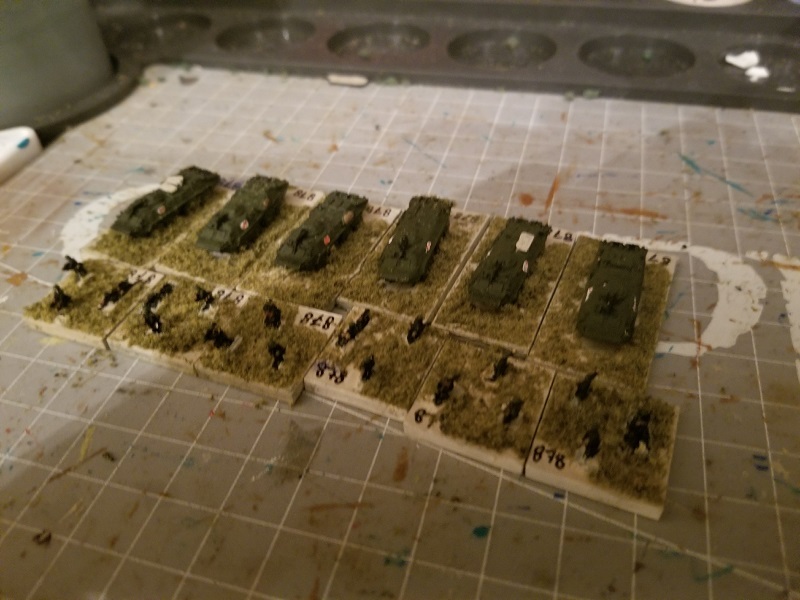 I added more units to my Naval Infantry Brigade, starting with the 1612th Artillery Battalion. The unit is made of 3 batteries of 2S1 122mm howitzers and an FO mounted on a ACRV. There should also be 3 ammo trucks (one for each battery), I'll probably add them later. 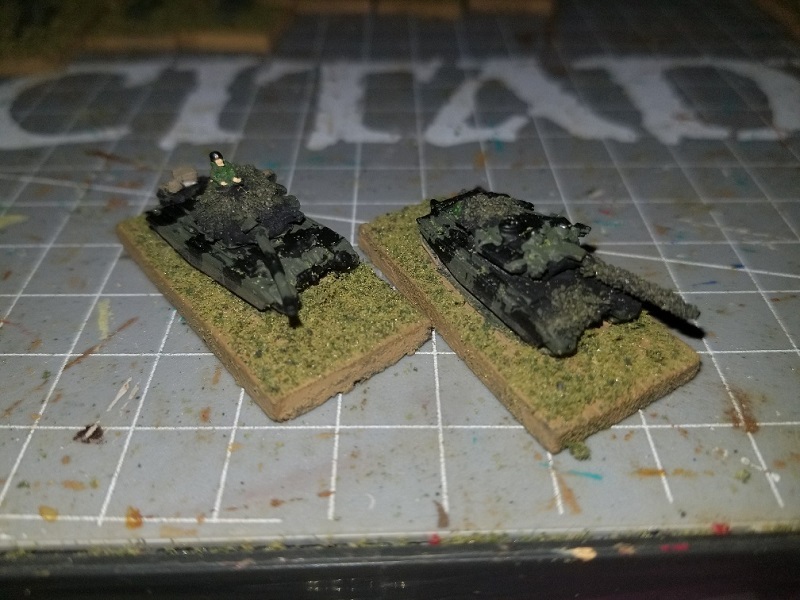 Next up I have the 112th Tank Battalion. I decided to change things up a little and paint the tank battalion camouflage as I found a color plate from the 112th battalion T-55 painted such a way in the early 90s. The main part of the battalion, 3 companies of PT-76 amphibious tanks. The MBT company which larger than the others. The unit is made up of 3 T-55AM tanks. This will allow me to support each infantry battalion with 2 PT-76 and 1 T-55. Next up I have some Meddle Eastern Building by GHQ. I based them a LONG time ago but I never got around to finishing them until now. The bases are a bit large. This because I originally based them for Spearhead. Not exactly sure if I'm OK with the road color I might change it later. Finally I decided to spend some of my Christmas Amazon Money. In addition to buying a couple of books I also brought some LITKO barrage markers. Well that's the new stuff for now. I hope to get more done soon. until next time. GnomeCon is over and unfortunately/fortunately they didn't schedule my game. I wasn't too upset because I still had two ground units to finish painting. Now that I've got time I can finish them up at the level I want. I still plan to play the sometime after St. Patrick's Day. As for Gnome Con I still got to play some great games including Christian's new roller derby game. 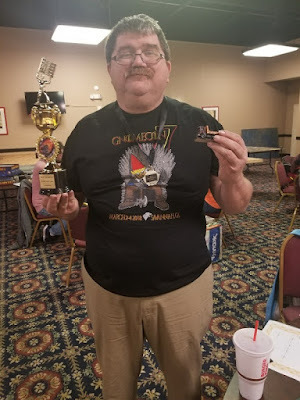 I also won the Rubber and Lead tournament. Yesterday I completed one the last units needed for the ground game. 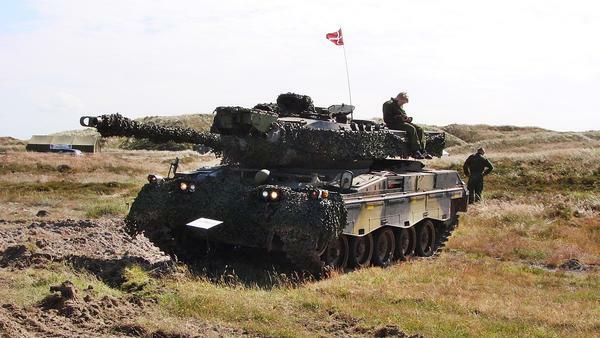 That being the danish reinforcements, a mechanized battalion. Here's the unit all together with a few extras. I'm thinking of naming the 2nd BN, Guards Hussars Regiment. 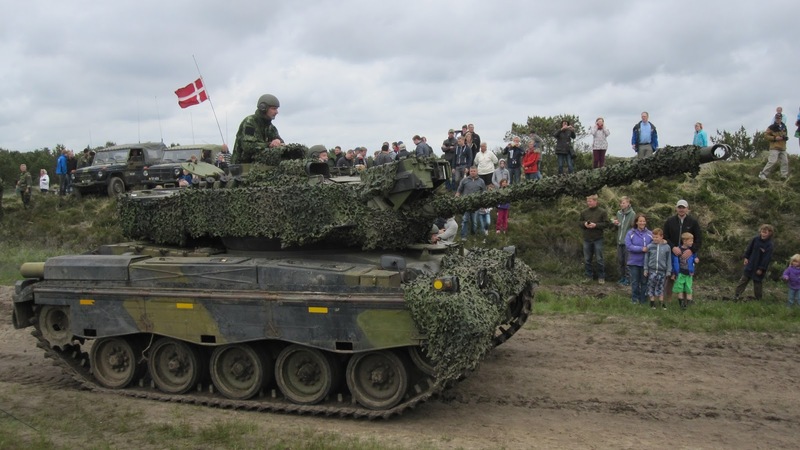 The danish battalions during the 1980s were a mix of heavy light and reserve units all in the same battalion. Now to go over the different units. First we have the two mechanized companies mounted on M113s. One platoon out each would be part of the reserves. Next we have the battalions motorized company, mounted on Unimog trucks. This unit was also part of the reserves. 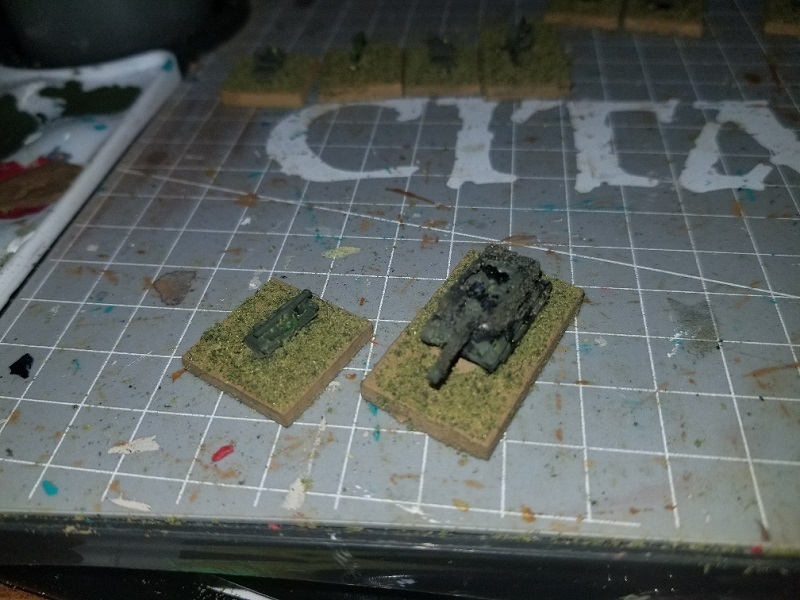 Next we have the battalion tank company, equipped with Centurions. In addition to adding baggage and ammo crates, I tried a new technique to add camouflage netting to vehicles. It seems to have work very well. Finally we have the battalion HQ and support units. 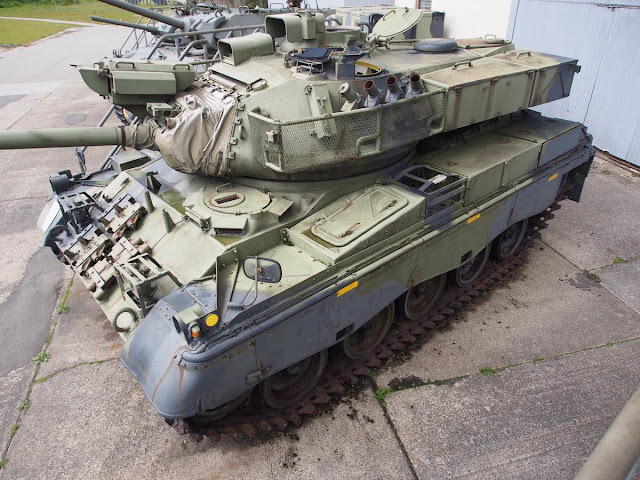 This includes a Self-propelled 120mm mortar, a pair of jeep mounted TOW missiles, and the command track, a M113 with a lot of camo-netting on it. Need to brush off some of the extra flock. As for the extra's most are from the brigade artillery battalion, to include a Hamlet missile team, a 40mm Bofors AA gun, and an FO Jeep. 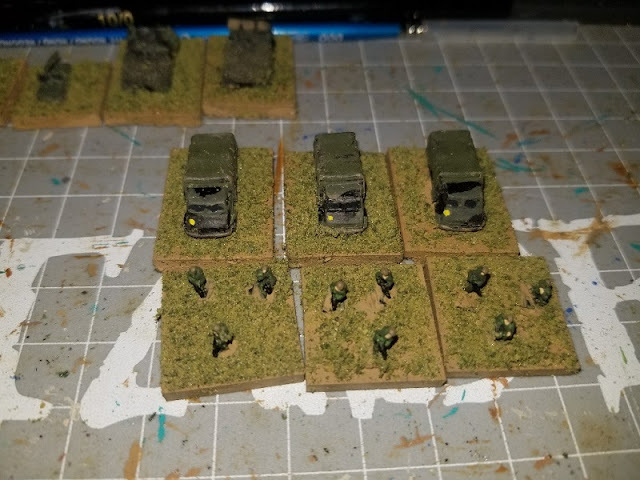 The other extras are a recon platoon from the divisional recon battalion and a jeep with a 106 Recoil-less Rifle to support the territorials. The recon platoon is equipped with M41DK light tanks. These were M41 walker bulldogs that the danish pimped out with laser range finders, Thermal sights, extra armor and stowage racks. No body makes one in 6mm so I had to modify a H&R M41. Here' what the original looked like. At first I thought doing the forward stowage racks was going to be a pain. I thought of making them out of metal mesh but felt they would look kind of hooky at this scale. Luckily in most of the pictures I saw, these tanks while in the field had their whole turrets covered in camouflage netting. So using plastic card, I added a laser sight, some rough sides skirts, and made the turret more box like. Then using my new technique, I covered the whole thing in camo-netting. The finished result is not pretty, but it's serviceable. 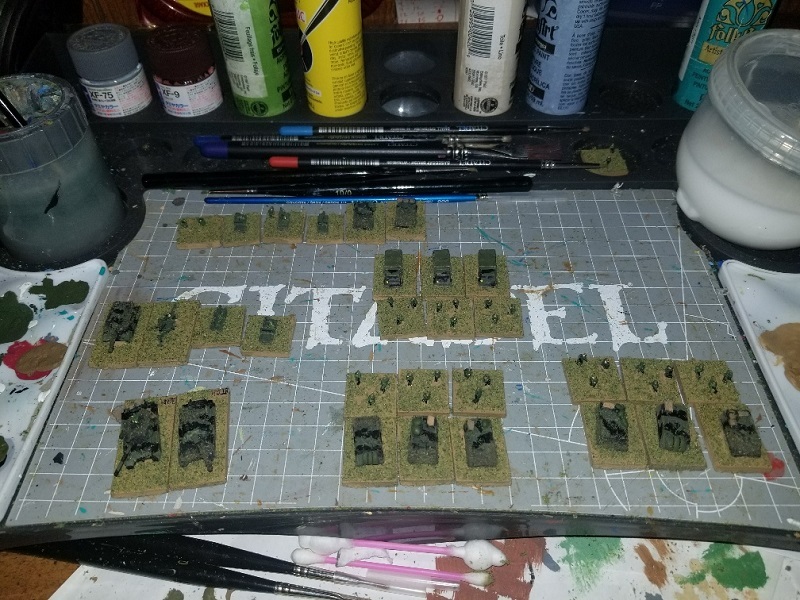 I think I'll take a brake from painting modern units next week. Maybe paint some new WWII or ACW. I continuing to work on my invasion game hopefully I'll have it done by GnomeCon. If not I'll play it out within the next few months. 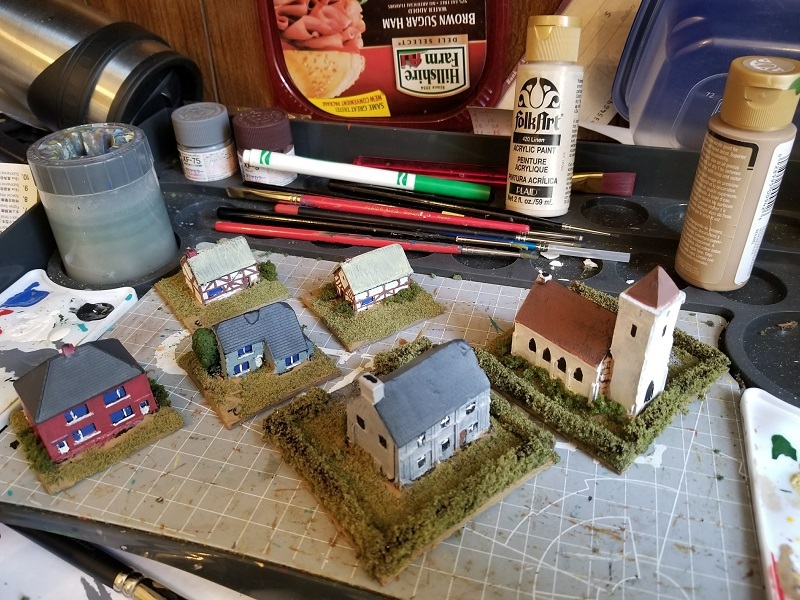 This time I painted even more rural houses, I should have enough now. 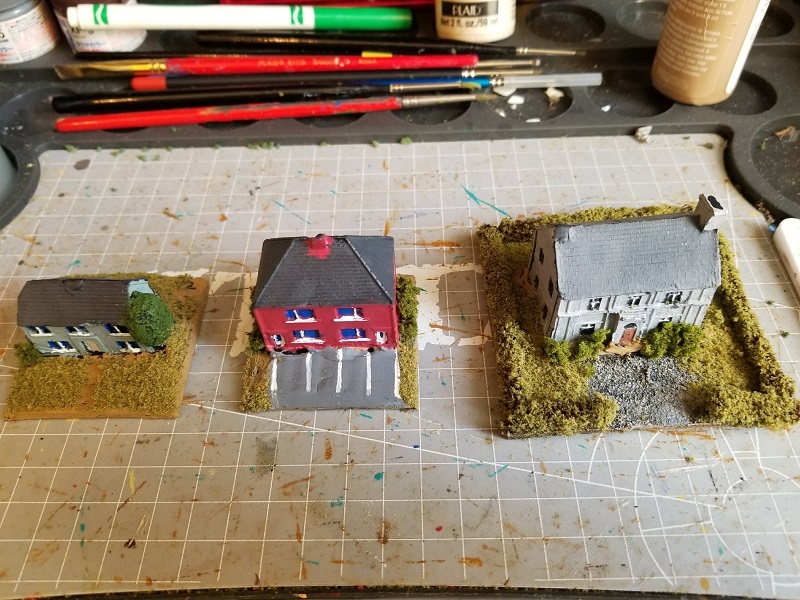 Here's some picture of the new houses. Most of these are houses I brought at Rapier a few years ago. And now for something completely different. 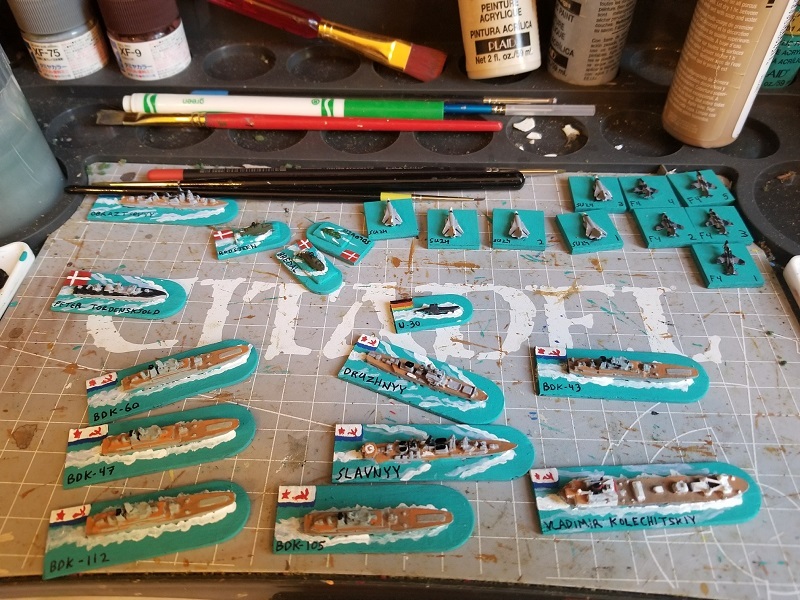 I know I stated a few post ago that I was done with the ships and I am, for the naval game. 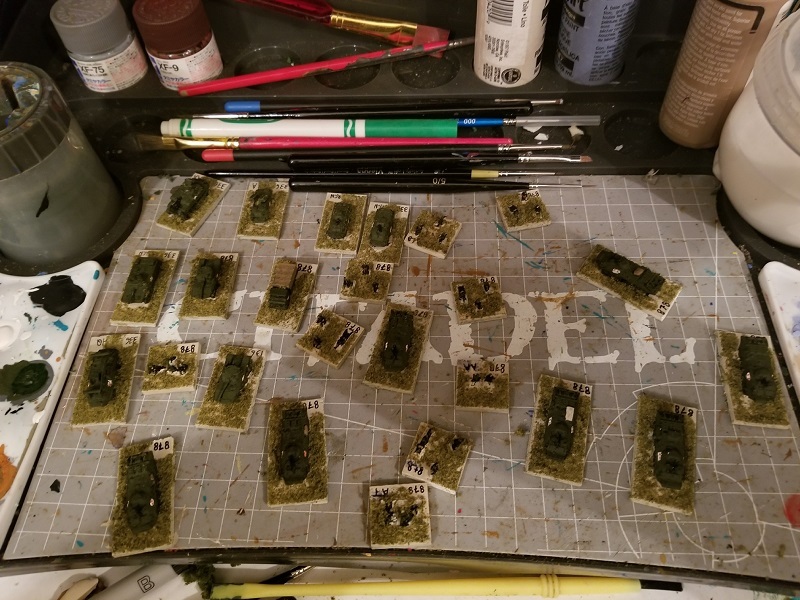 I still need some LST for the ground game to mark the landing zones for the naval infantry. Since hardly anyone makes Russian LST models, I only found an Alligator class model that cost $50 (too much! ), I decided to make them from scratch. 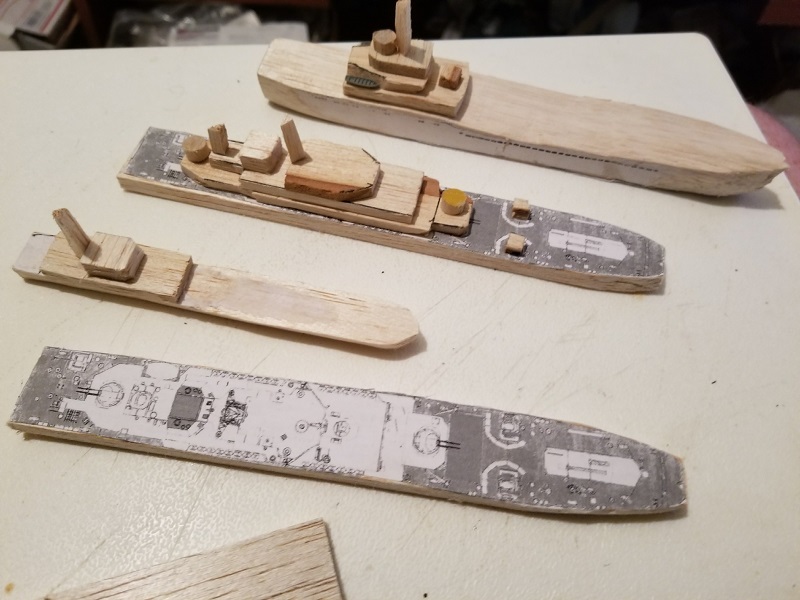 Using balsa wood and scale line drawings for reference. Since these models well be representing individual ships, instead of groups, I made them 1/600 scale as opposed to 1/300. Here's how they came out. 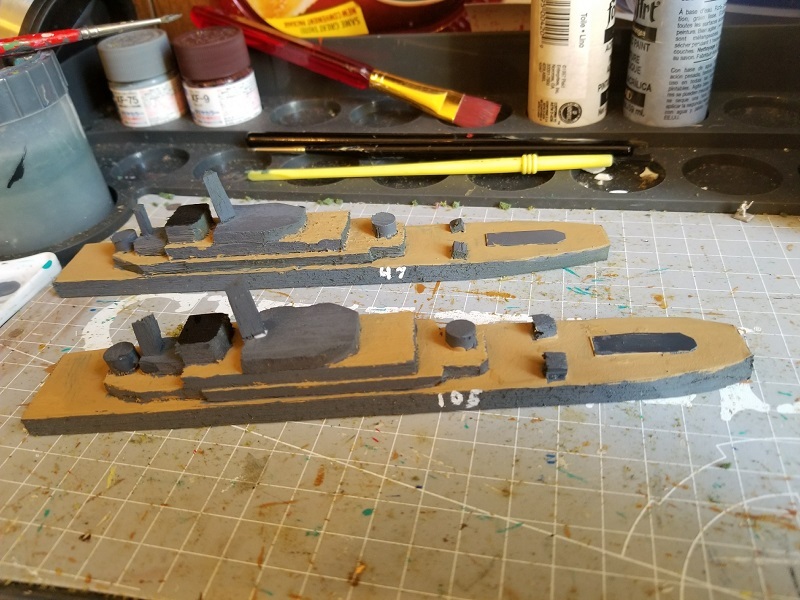 Two Ropucha class LSTs. These were the most complex to be built, so of course in needed two of them. 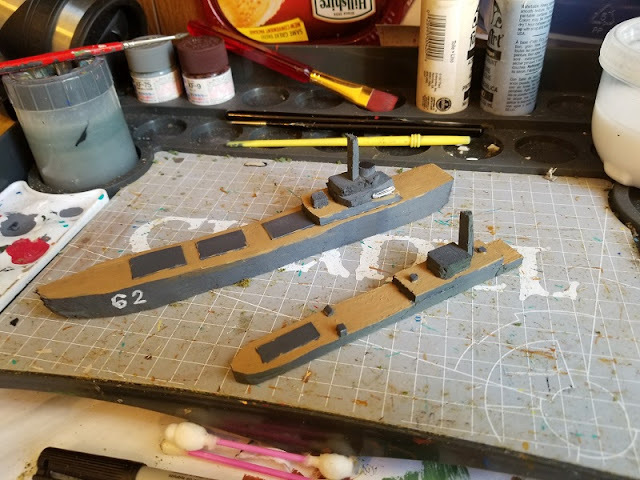 An Alligator class LST and a Polnocny class LSM. There not pretty, but they'll get the job done. 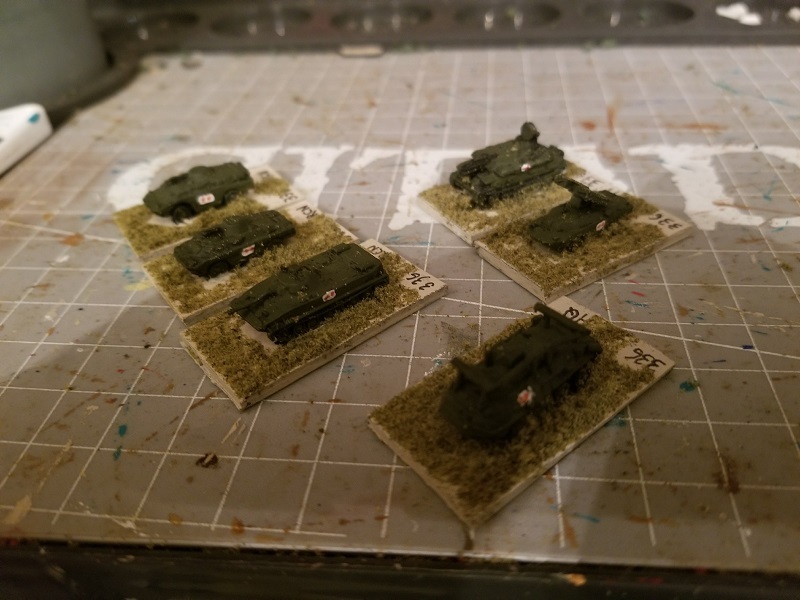 Now I'm working on my next batch of NATO forces. Here's a sneak peek. Anyway that's what I got now. I continue to make progress on my invasion game. Here is the latest effort, the 878th naval infantry battalion. This the second battalion in my naval infantry brigade. I've also started working on some of the brigade support units. Here's all the stuff together. Here we have the main fighting part of the battalion, it's three infantry companies. Three of the infantry platoons are backwards showing the white unit color on the back of the stand. 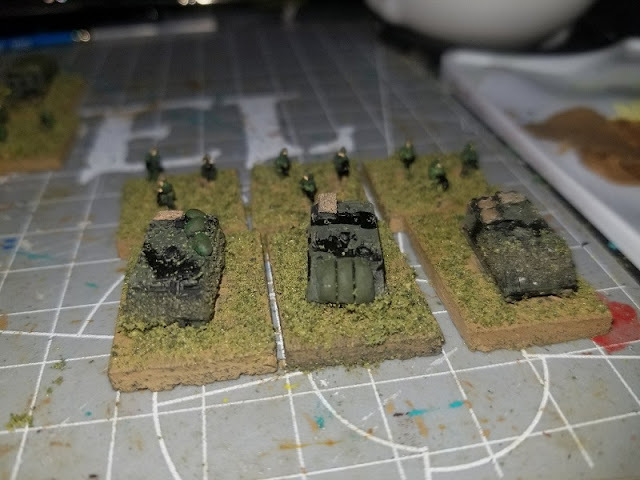 The BTR-70s are GHQ, while the infantry is H&R. Next up we have the battalion support units. This includes the Anti-tank platoon, anti-aircraft platoon, and the mortar platoon. For the mortar platoon I've given the option for the unit to have either a regular 120mm mortar or a 2S9 Self-propelled mortar. 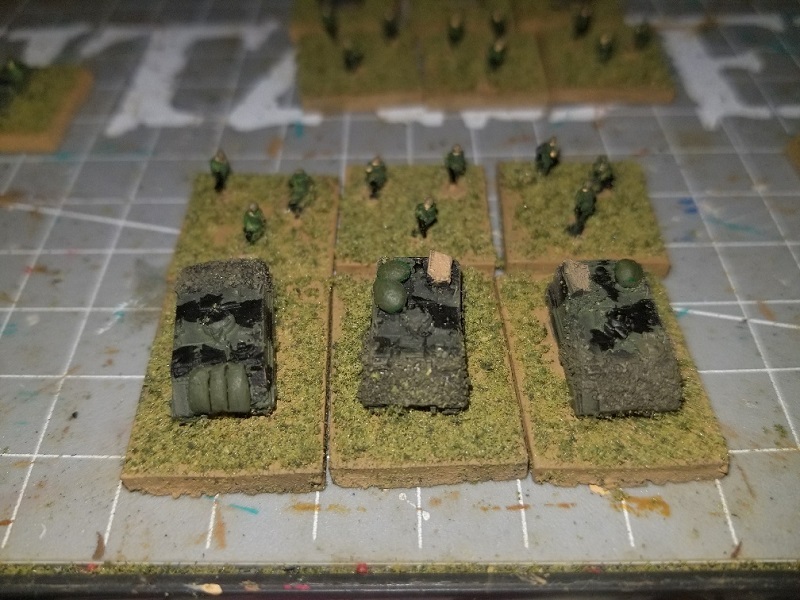 Once again, the infantry weapons are H&R and the BTRs GHQ. The Gaz-66 truck is Scotia and the 2S9 is C&C. 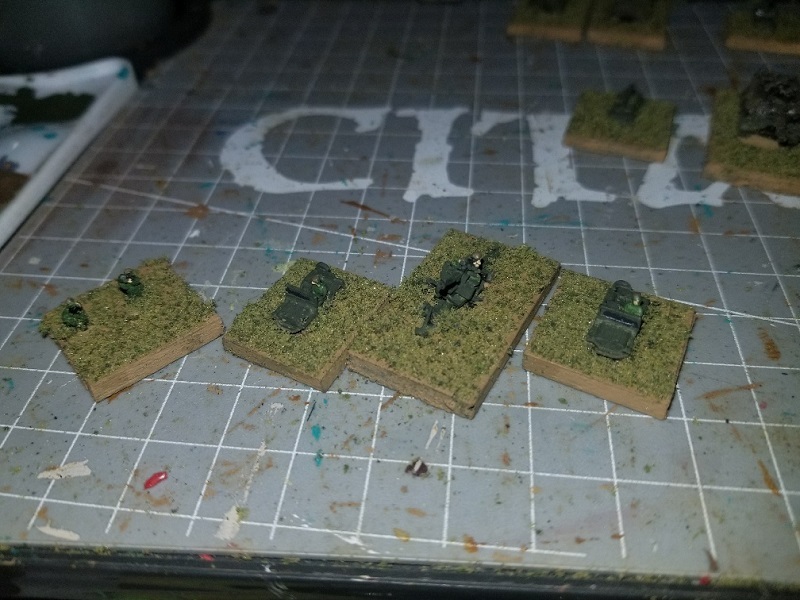 Finally we have some of the brigade units, including the brigade HQ, recon company, and anti-aircraft battery. The BRDM-2s are either GHQ or Scotia. 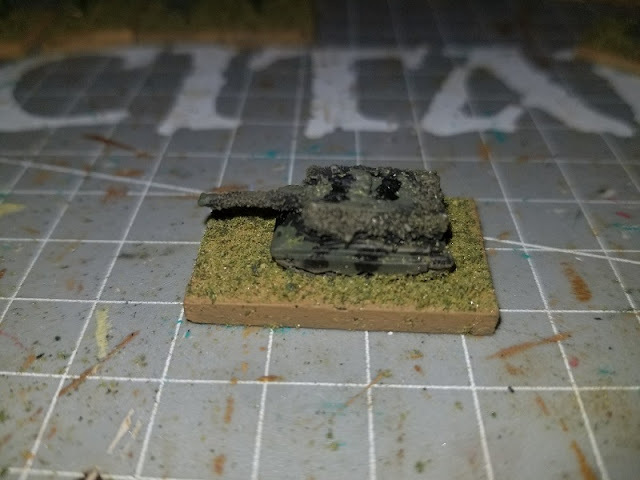 The PT-76 is C&C. The ZSU-23 is GHQ, while the SA-9 I believe is Scotia. Brigade HQ BTR-60PU is H&R (The photo doesn't do it justice). 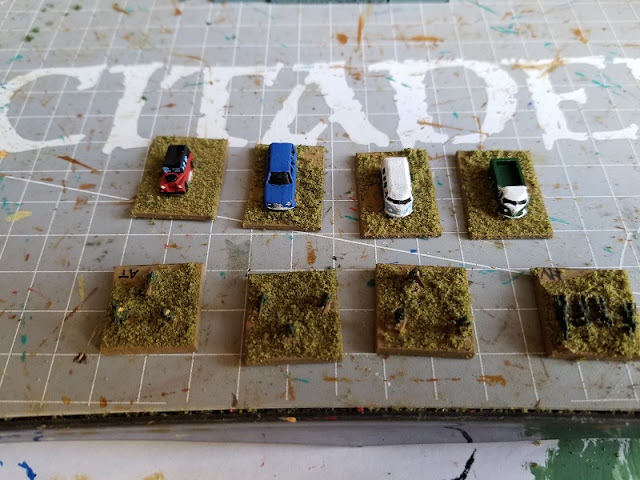 Next I'm going to do more of the terrain I'll need for the game. I still have two more battalions to do, as well as some aircraft. Hopefully I can make it in time for Gnomecon, if not I'm definitely playing the game later. 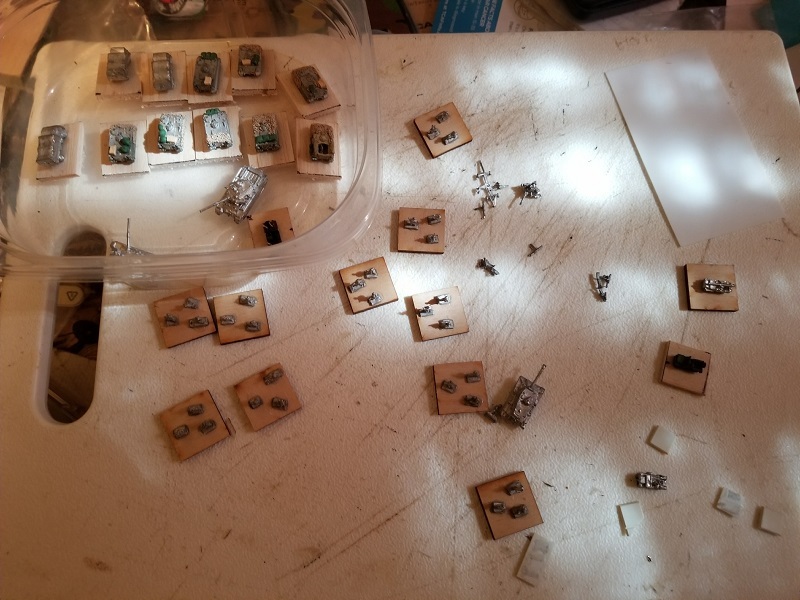 I just finished all the ship need for my GnomeCon invasion game. Now I just need to finish the ground units and I'm good. Here's all the new ships together. Below we have the new Soviet combat ships including a new Krivak I FF and 2 Kashin DDG. The Kashin DDGs are something my Soviet navy has be badly needing. Next we have some of the soviet landing ships as well as an auxiliary. 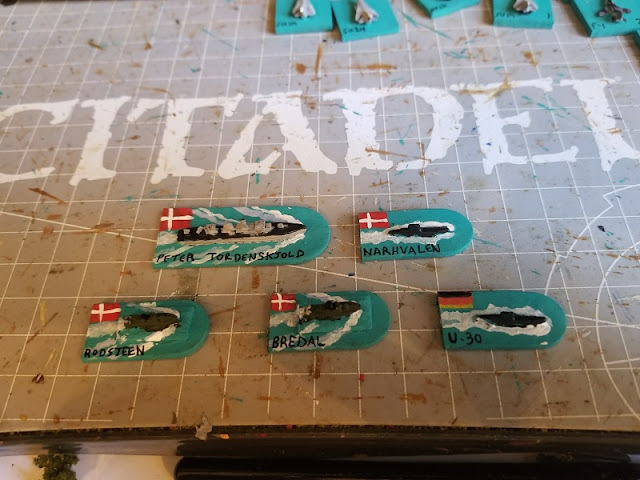 For NATO have have the remaining Danish ships, a FF, two missile boats, and a German made submarine. I also have the Germans sub in the picture. Finally we have the new aircraft. For the Soviets a group of Su-24 Fencers. 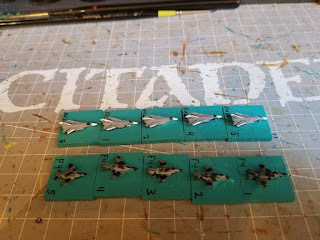 I also did a group of F-4s these in German camouflage, not my best work. Now I just need to finish the ground units. I already have a group primed and ready to paint. I am a little concerned about GnomeCon itself as they have yet to list my games on their website or any other games for that matter. 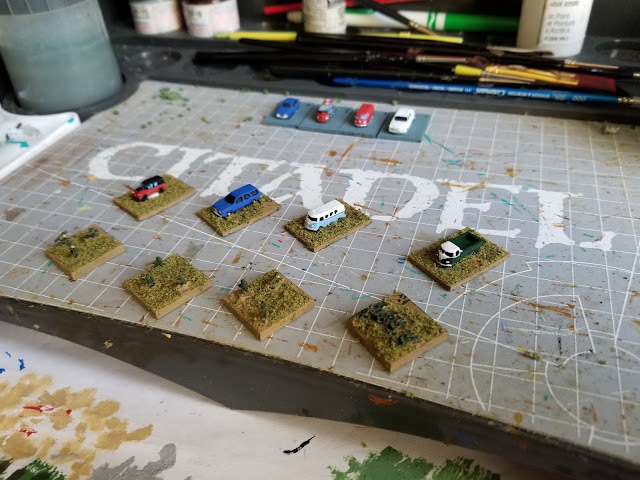 This time I decided to work a little on the scenery for Invasion game. 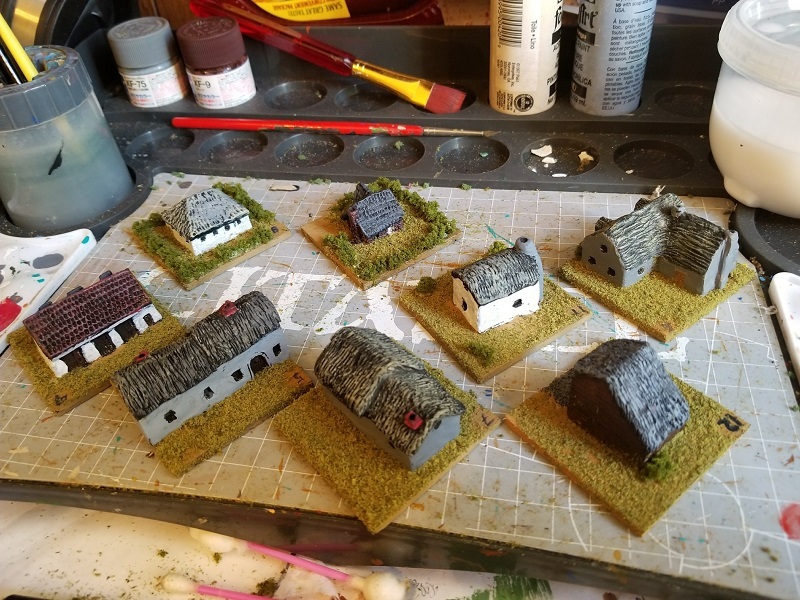 To this end I decided to paint or repaint some of my micro-armor houses. These particular buildings hold a sentimental value to me being the first war gaming buildings I bought some thirty years ago. In that time some of them have been damaged and I decided to use this opportunity to fixed some of them up. The buildings before I started. As you can see most of the damage was to the bases which I didn't care for anyway. 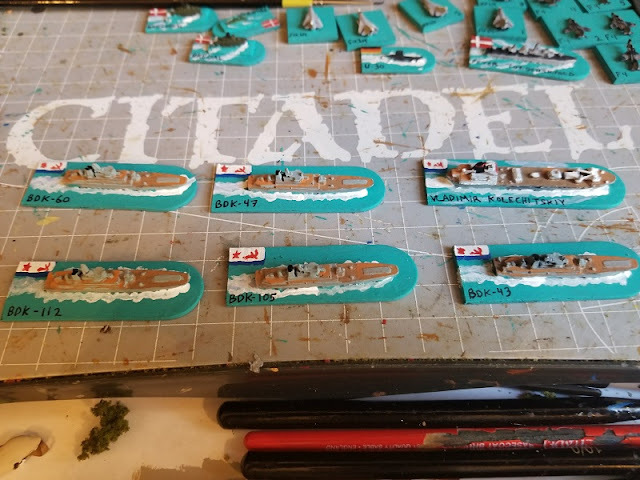 The first step was to glue them to bases. I then used Acrylic Gel to make the bases somewhat flush. 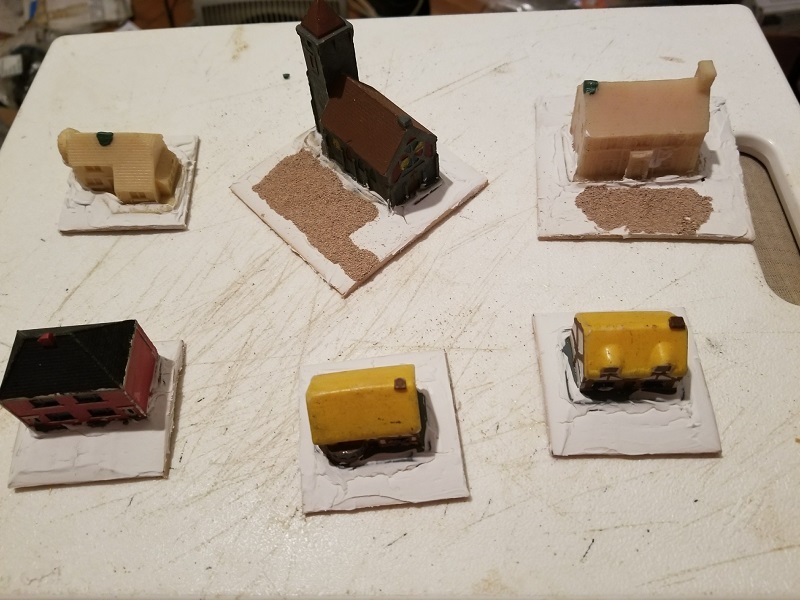 For the Church and the Mansion I used fine model railroad ballast to make gravel drive ways. 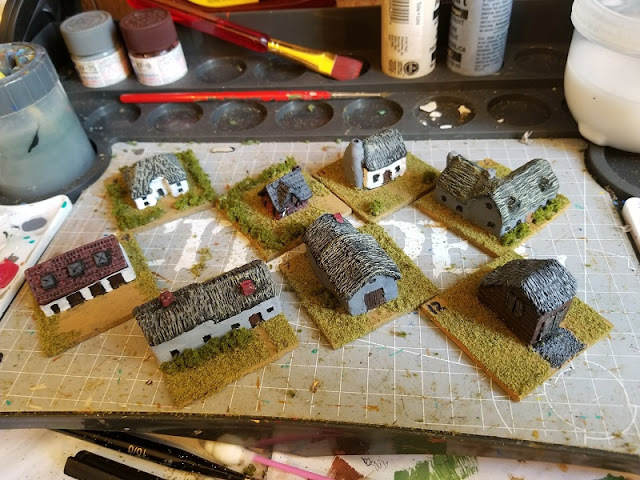 Finally I used green stuff to try to repair some of the roofs. Now it's time to move that bus. Hmm going to have to touch up the apartment building. For the two buildings on the left I deliberately left the roofs partially painted as it gave them more texture. 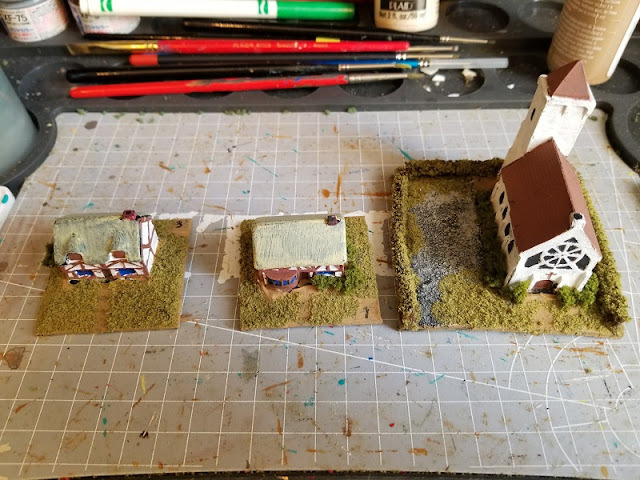 I also numbered the smaller buildings. All the buildings together. This photo shows the backyards. One thing I think I'll do next time is use a single colored flocking on the hedges to make them stand out more. 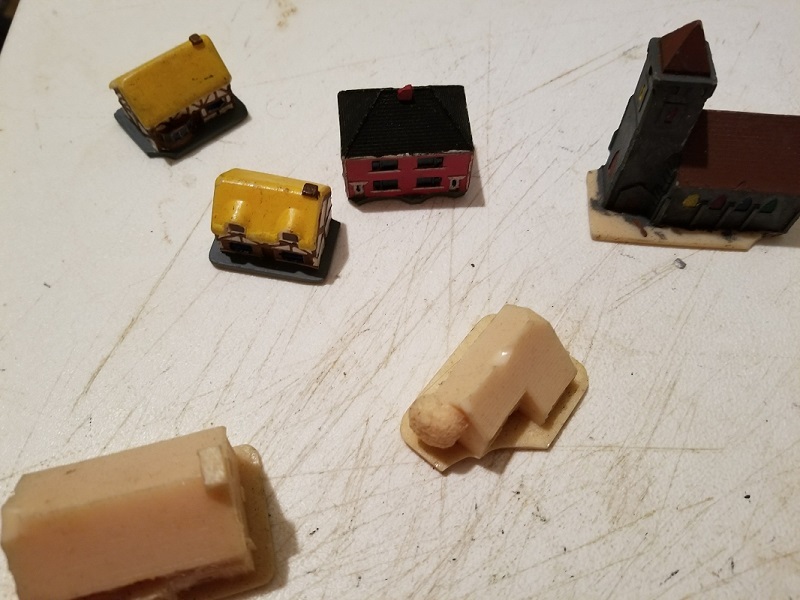 Well that's the first batch of buildings. (I have to do at least 6 more.) Next up I'll be painting up more ships for the naval part. 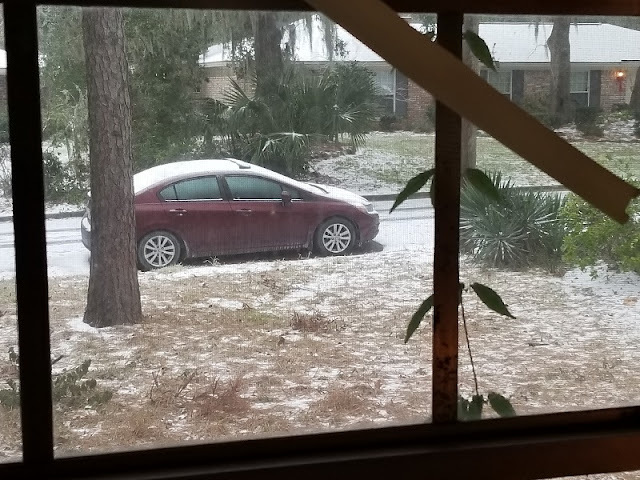 My Car while I was stuck on the island. This doesn't mean I haven't been working as I have finished my latest unit for the invasion project. Here we have a Danish territorial company, consisting of 3 infantry stands and 1 heavy weapons stand. The whole unit is mounted in a variety of civilian vehicles. 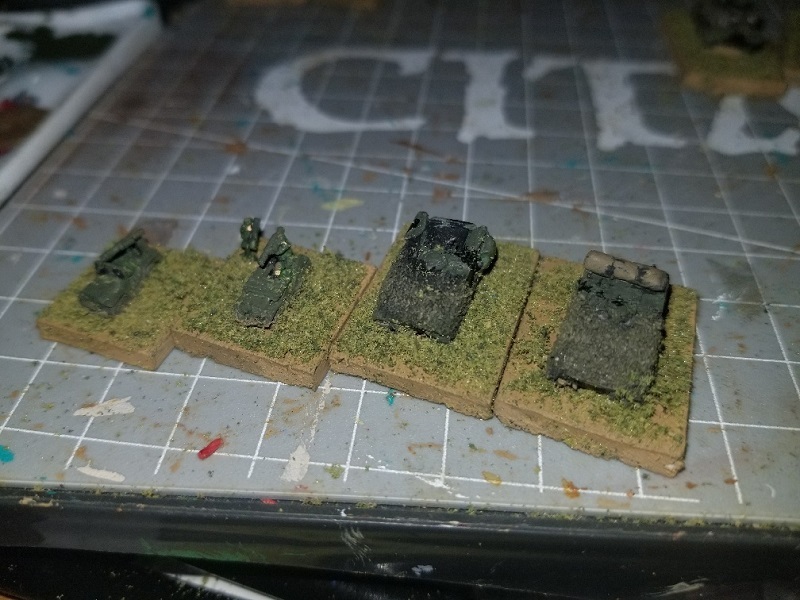 I was inspired by Richards Danish Home Guard units at Cold War Hot Hot!. One of the infantry platoons is marked AT. This represents the infantry equipped with Carl Gustavs, while the rest have M72 LAWs. The infantry is H&R WWII US infantry. The land rover is a Scotia model. The station wagon is an old In Service model and the Volkswagen van and truck are form Shapways. I had a slight accident with the land rover that required it to be glued back to stand just prior of taking the photograph. 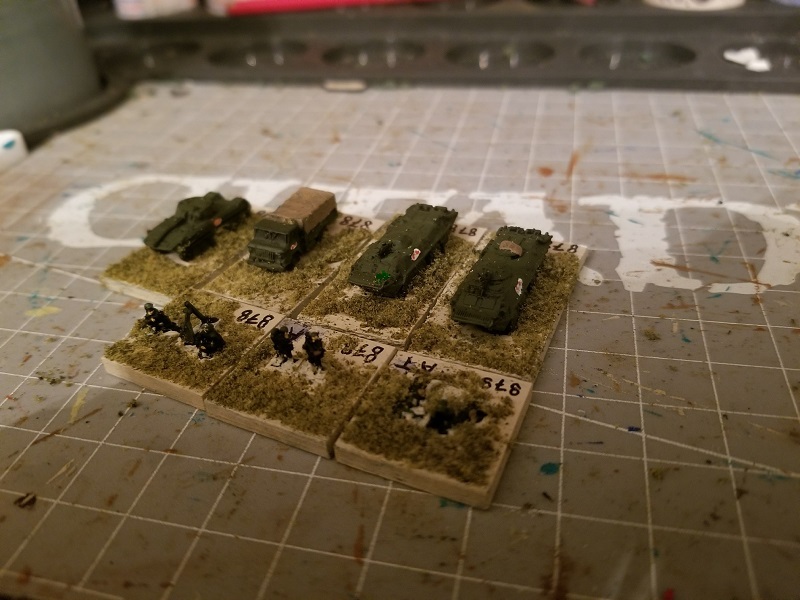 In addition to those I also painted up some more civilian vehicles to act as road side objectives for the Soviets. 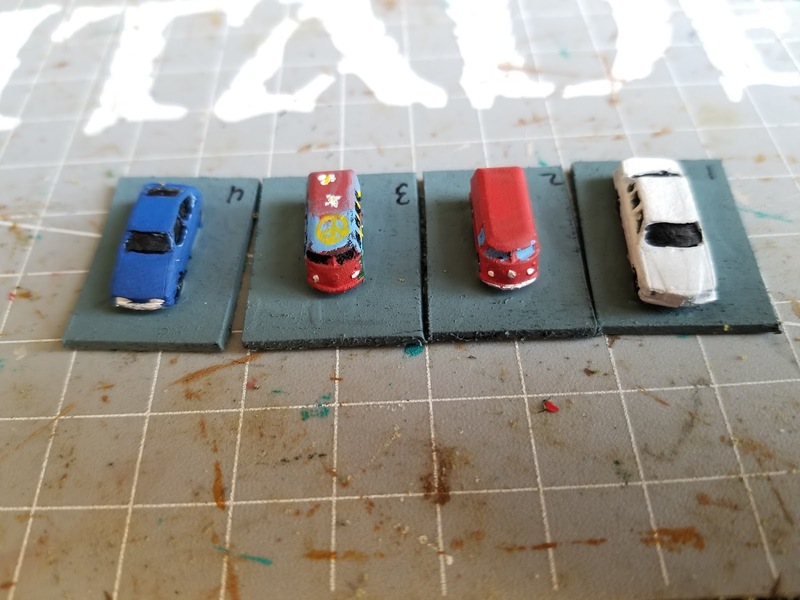 The cars are some more of the old In-Service models, while the vans are Shapeways. The hatchback's paint job was inspired by my grandparents old Pacer. 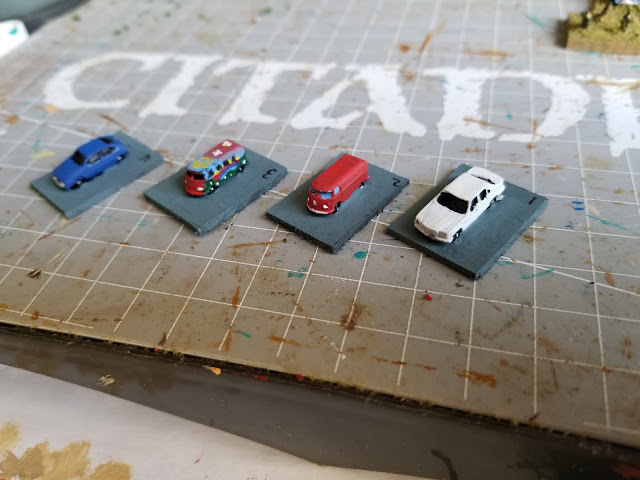 Having a bunch of old style Volkswagen vans, of course I was going to paint one as the Hippie-Mobile. Anyway that's the first new stuff for the new year. 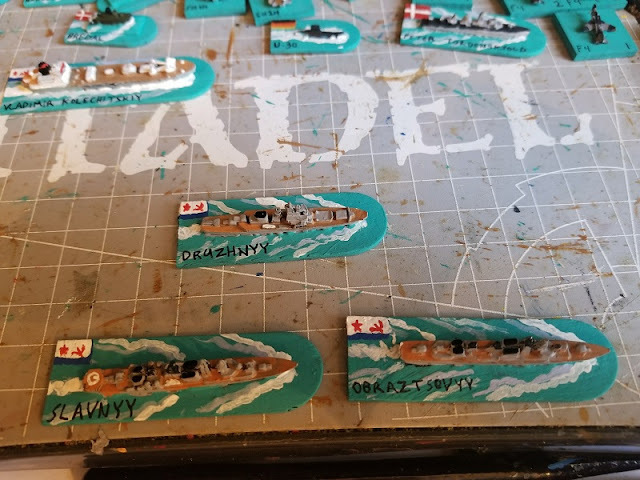 The ships I order came in sooner than I expected so I'll either work on them or some new terrain pieces. I still need to make one more order before I have everything I need for the game. More Soviets for Cold War Commander.